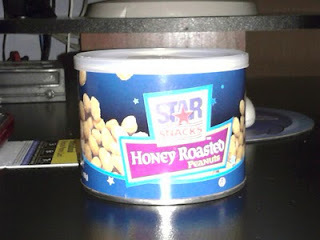 Recently, I am pretty much addicted into this kind of peanut in can. It all started when I bought his can at dollar store one time we went there for a walk and for some things that I want to buy. Me and just baby C stroll from home to that store. It's not that far and it's fun walking because not just you smell the fresh air, seen other things and people you'll also be able to exercise while you push the stroller. I've bought another container of this because the one that is on the picture is already empty. Oh, I almost forgot the second can I bought was also empty now. So I guess I have to buy another one. Looks like such peanuts are yummy huh. I will try it too the next time I will go to the market. Thanks for sharing sis..